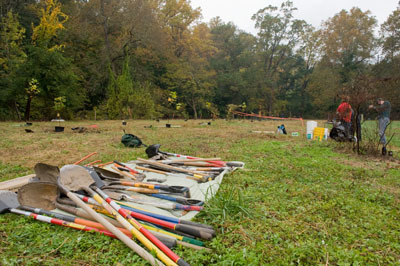 On Thursday, October 22 over 35 volunteers from Swarthmore College, Scott Arboretum, and CRC Watershed Association gathered to plant 83 trees and shrubs. These plantings were the result of a TreeVitalize Watershed Grant awarded from Pennsylvania Horticultural Society (PHS) and Delaware County Conservation District (DCCD). Volunteers spent the morning planting a 2,000 square feet or 4.59 acre riparian forest buffer along the Crum Creek corridor. These plantings were in addition to the trees planted last spring by Swarthmore College volunteers in the area newly name Roger’s Grove, which is the area south of the train tressel. These efforts are part of a study done by the biology department, professor Jose-Luis Machado, delineating knotweed populations and lacking native plant buffer. Along this corridor of the Crum Creek, the invasive knotweed, Polygonum cuspidatum, forms dense thickets that exclude native vegetation. As a riparian area (an ecosystem that occurs along a watercourse or water body), the banks of the Crum Creek are under significant threat from knotweed because it can survive floods and then rapidly colonize scoured shores before native vegetation can establish. Polygonum cuspidatum is an upright, shrublike, herbaceous perennial that can grow to over 10 feet in height. It produces minute greenish-white flowers that occur in attractive, branched sprays in summer and are followed by small winged fruits. The root system consists of long, stout rhizomes. Because of these rhizome roots, knotweed should not be removed by digging up the plants. The rhizomes will simply break or be cut apart creating new plants. In order to control the population along the Crum Creek, glyphosate (an herbicide) was applied twice to the foliage of the plants, once in the late summer and another in early fall. 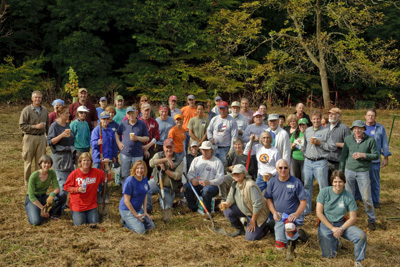 Volunteers then planted the riparian forest buffer with native species to shade out and, once established, out compete the knotweed adjacent to treated to treated populations of plants. Bryn Richard, a local landscape architect, selected the native plants according to the Wetland Indicator Status from the USDA plant database. This indicator identifies if a plant occurs almost always, likely, usually, or equally likely in a wetland. From this indictor Byrn located native plants closer, further, or on a raise adjacent to the creek bank. 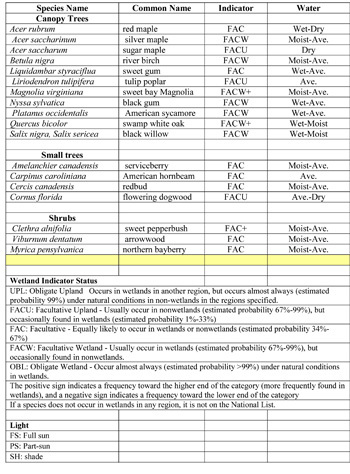 See the complete list of plants and their indicator below. If you visit this new planting, you will notice they are planted in rows 15 to 20 feet apart. Many of you may notice this is opposite of what is recommended to homeowners. The rows are to allow mowing of the meadow two to three times a year until the plants are established. They were also planted close together to quickly create a canopy of shade to shade out the knotweed. These young plants were also planted with a weed mat to discourage weeds, and a deer cage or tube to prevent additional damage. Once the plants reach an appropriate size volunteers from the CRC Watershed Association will remove the cages and mats. If you have a canopy of knotweed growing along a bank near you, you can apply for a 2010 Southeast PA TreeVitalize Watersheds Grant Program. Applications are due to the Delaware Co. Conservation District before Friday, November 13th. Thank you to all the volunteers, Bryn Richard, Anne Murphy, and CRC Watershed Association for helping to make this project a reality. And of course to PHS and DCCD for providing the support for this restorative effort. Great program. Do you know of any agencies funding projects like this in New York? I live on Long Island and see knotweed all over. I would like to see about getting my class involved in something like that.